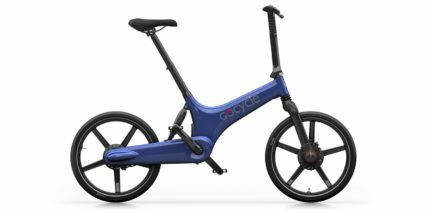 The Gocycle GS is a simplified, more affordable “sport” product that’s based on the G3 platform. 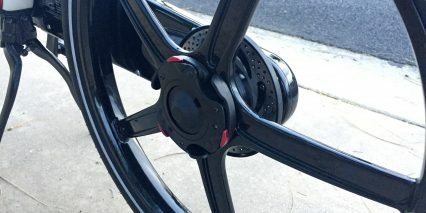 That means, you get torque-sensing pedal assist, smartphone app support, and the same lightweight magnesium frame, wheelset, and cleandrive casing that make the bike so unique, durable, and beautiful. 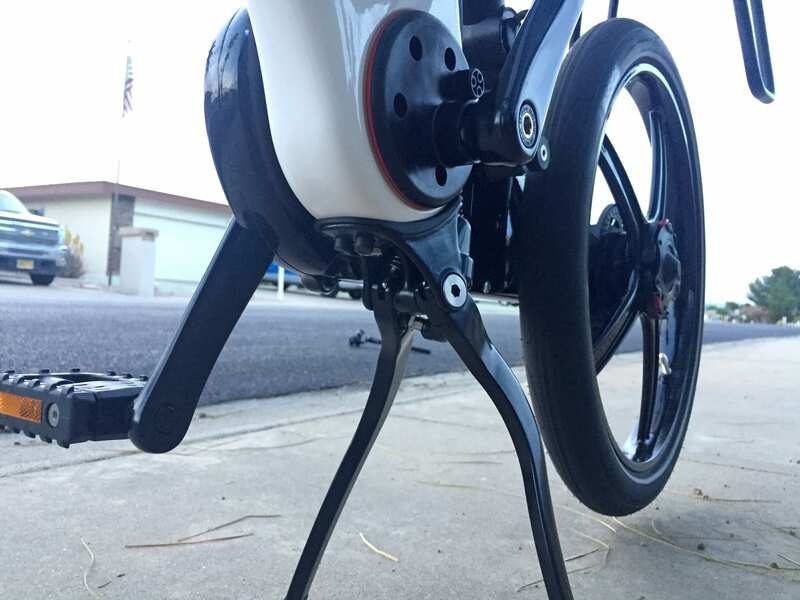 This product does fold, but not in half like most competitors… It pivots inward and both wheels pop off. 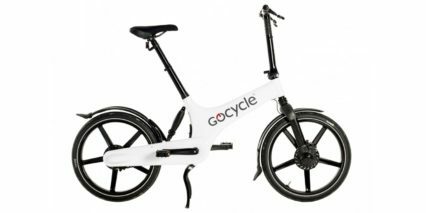 Gocycle sells a broad range of accessories that add utility or allow for easier transport, including a $299 portable docking station. The design is fantastic, there’s a spot for the bike frame, both wheels, and the seat post. 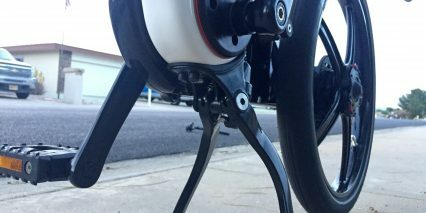 Once zipped, the bag protects your bike from dust and water splashes, and makes it easy to wheel around on caster wheels. 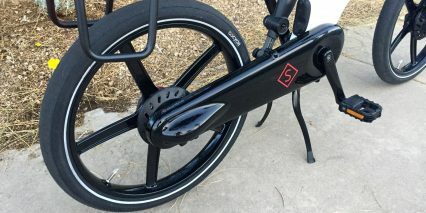 You can really tell that every aspect of the Gocycle has been custom engineered. 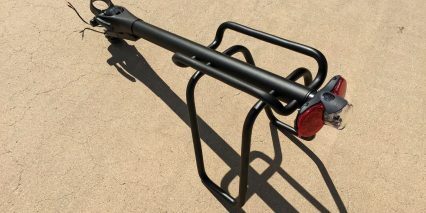 There are active leads for attaching lights that run off the main battery, slots for connecting the optional rear rack… and plastic covers to conceal the slots when not in use, the locking pin for the rear shock can be replaced with a cable-lock holder, and there’s even a little hex wrench holder underneath the saddle! 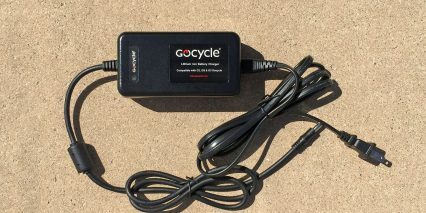 Yes, Gocycle has been refining this same core product for over a decade, and it really shows. The only thing that hasn’t been engineered to perfection is the high price point. The founder, Richard Thorpe, left his dream job at McLaren Automotive in 2002 to launch this company. I suppose he’s used to some very complex, custom engineered, and expensive transportation products. We got to speak for an hour before I filmed this review, and I spent all day with the bike to get a real sense for all of its unique features. 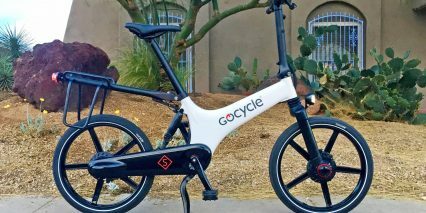 Richard told me that felt like he had been 10-years too early with the first generation Gocycle in 2009, but really started to find a niche with the G2 in 2012 and G3 in 2017. 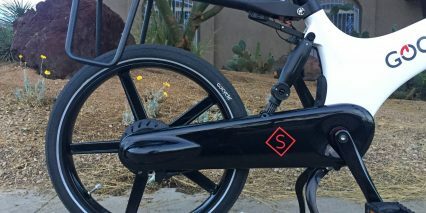 The GS was launched on Kickstarter, a popular crowdfunding website, in late 2017 and has become one of their top selling products. 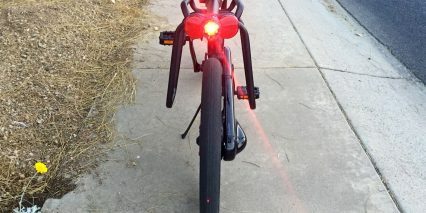 The biggest compromises that I noticed were the lack of a telescoping up and down adjustment on the stem, removed daytime running light on the front of the handlebar, and removed LED dashboard. 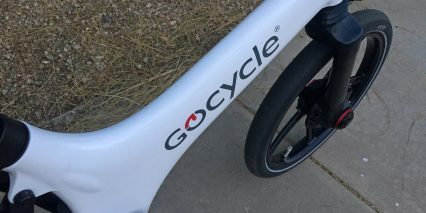 You can technically ride this ebike without using the smartphone app, but you won’t know how fast you’re going, precisely how much battery remains, or have the ability to adjust speed settings. 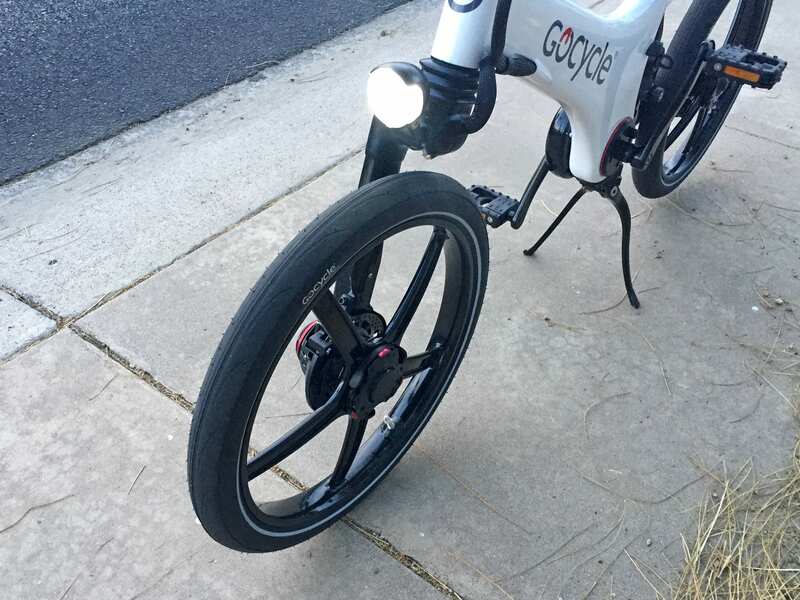 The product is great, in my opinion, but it does compromise a bit on handling and comfort because of the smaller 20″ diameter wheels… most folding and compact ebikes do. 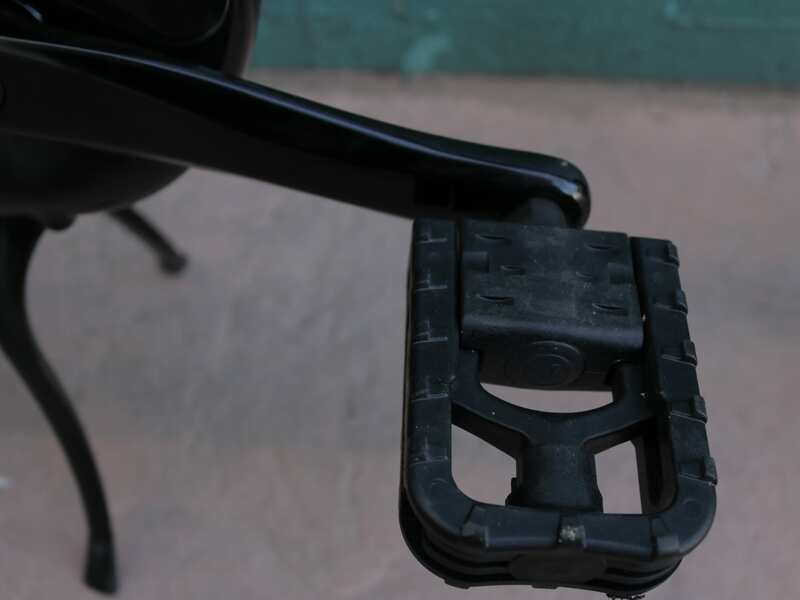 The kickstand works well, once it is deployed, but can be tricky to deploy because the plastic ridge to kick down on is a bit small. The throttle does not offer variable speed output, it’s just an on/off button, and it won’t work until the bike is moving ~4 mph (6 km/h) which defeats the purpose of using it to start from standstill. 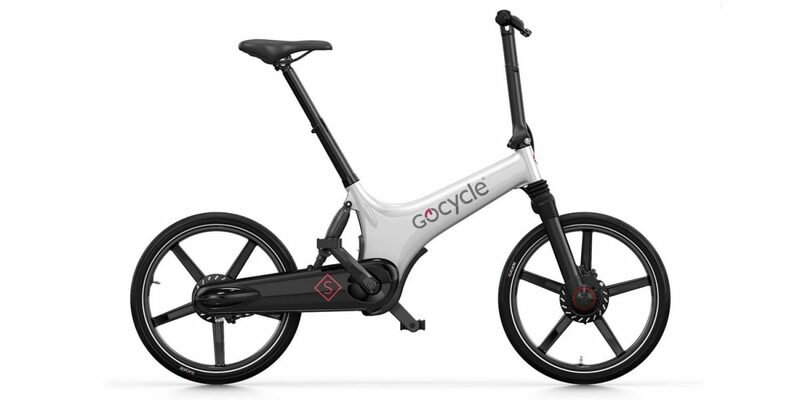 You definitely pay a lot for this product, even though it’s the most affordable Gocycle in the family, but the $2.8k price point doesn’t feel overly expensive compared to the much heavier and more simplistic competing products. 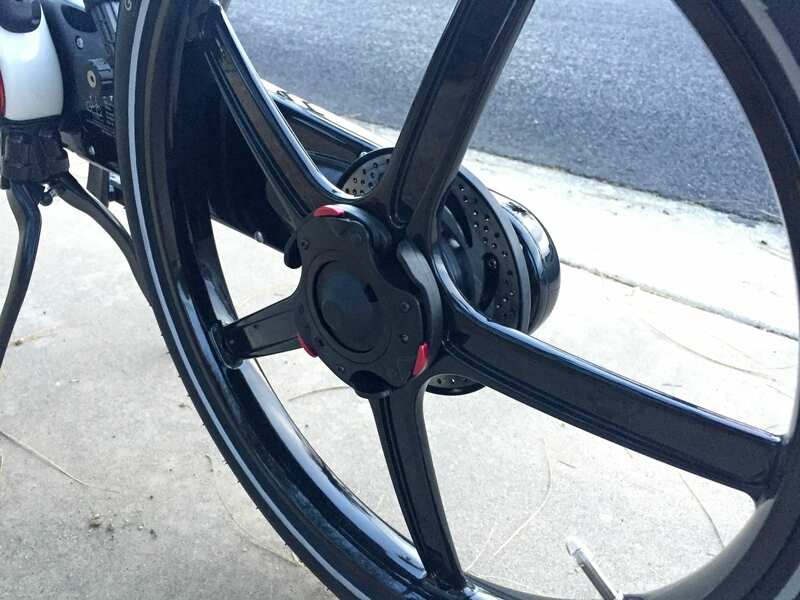 Driving this bike is an extremely compact canister motor mounted to the front wheel hub. 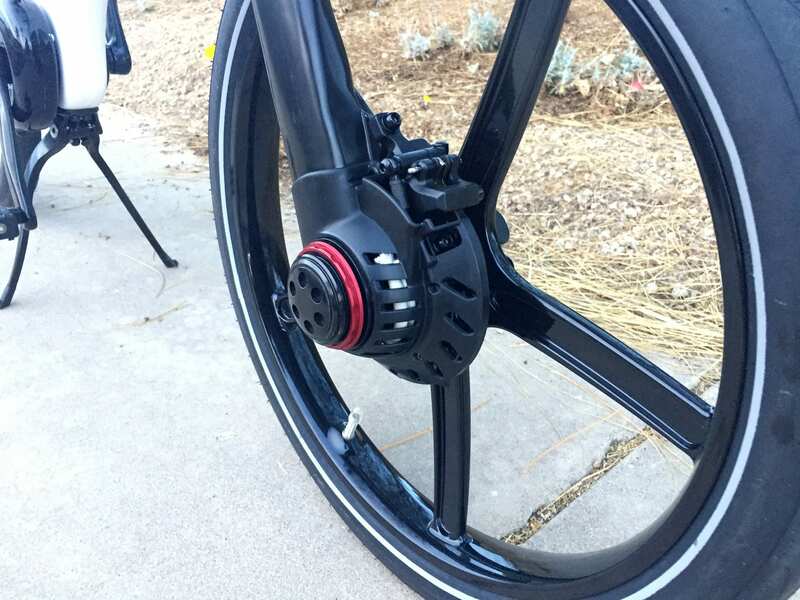 Richard told me that this thing offers nearly four times the energy density of a traditional hub motor, meaning it is smaller and lighter but delivers comparable power. 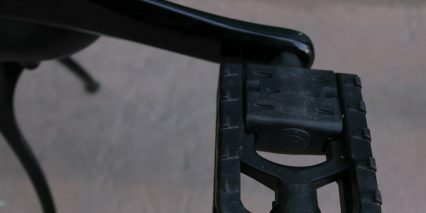 It is indeed small, nearly disappearing into the base of the front fork and disc brake housing. 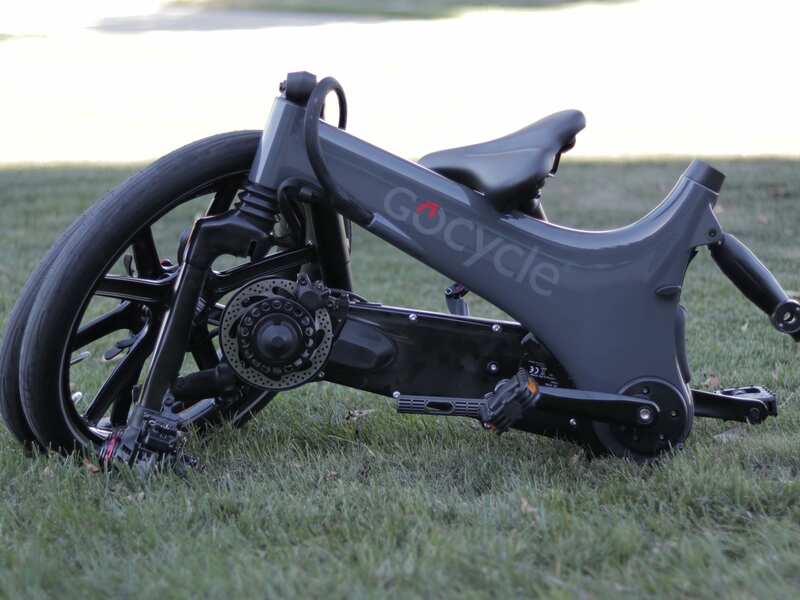 Depending on the firmware that’s loaded for your Gocycle, this motor will operate at 250 or 500 continuous watts. It peaks out around 60 Newton meters, and you can definitely feel it. All of the Gocycle products I have test ridden feel very satisfying to ride in throttle mode, which is where power is the easiest to test and gauge. Of course, throttle operation is going to spend your battery the fastest too. Zipping down an empty street at ~20 mph (~32 km/h) on such a compact bike with small wheels like this feels a little thrilling. 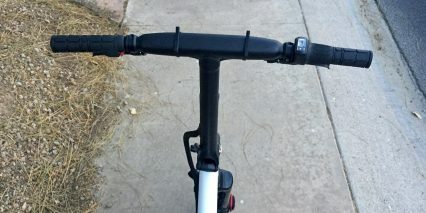 I was able to ride with no hands, a test I like to do with each electric bicycle I review, but this did feel a little squirrely. The steering setup is responsive, and that’s a mix of good and bad depending on your ride speed and personal coordination and balance. I felt most comfortable with both hands on the grips, making big swooping turns. I mention all of this because the optional smartphone app may or may not be within reach of your right thumb, which could be necessary to switch drive modes on the go. I suggest picking a mode and just leaving it once you start to ride. The only other controls to manage are the two-finger hydraulic disc brake levers and a Shimano Nexus grip shifter on the right. I mentioned earlier, how custom everything seems to be on this product. 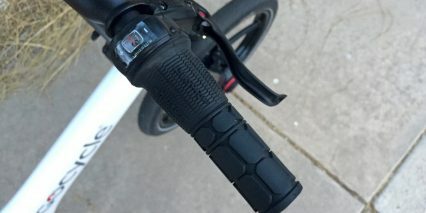 And, even the grips have been customized and branded as Gocycle. 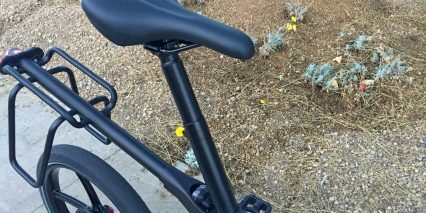 The left grip blends into the throttle button housing and the right is a half-grip that blends into the shifter mechanism. You can see the beautiful end result in the photos and how it all operates in the video review above. The only drawback to this motor design is that it produces more noise than some similarly specced, larger and heavier hub motors. The noise isn’t especially high pitched or annoying, more of a fan noise, depending on which level of assist or throttle mode you are utilizing. 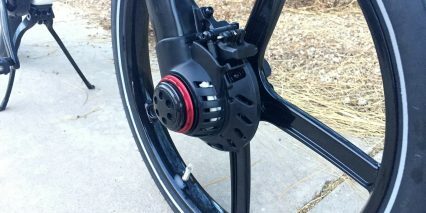 I do like how the front motor allows the rear internally geared hub and cleandrive casing to stay clean and separate. 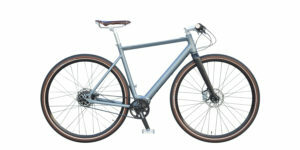 You won’t ever damage the drivetrain by using the motor as you shift gears, as is the case with many mid-drive motors. 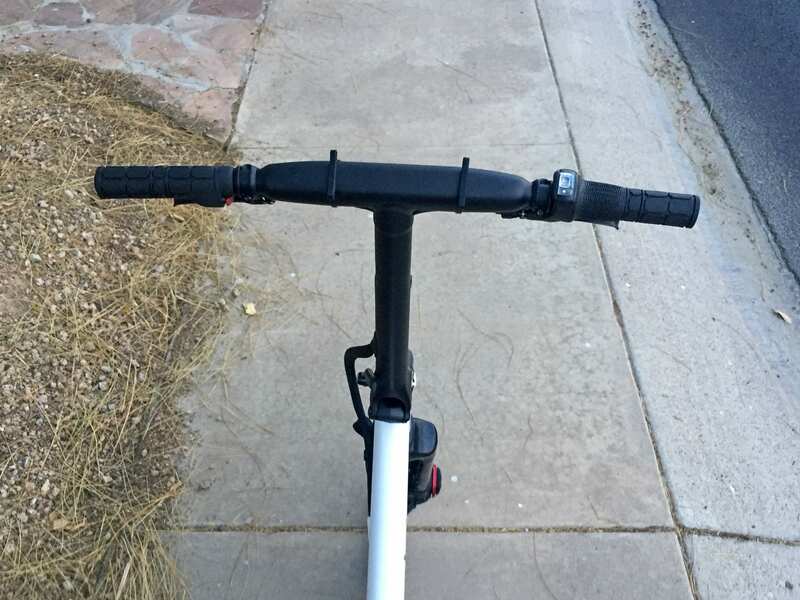 I was not able to weigh the motor independently but was told that it’s around 2.2 lbs, and it definitely tips the bike forward when lifting at the nose of the saddle… in large part because of the Vgonomic seat tube angle (basically, the seat goes up and back as you extend the seat post). 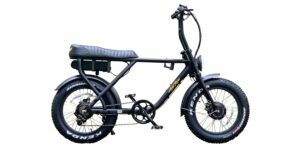 Powering this ebike is a compact, Lithium-ion battery that’s completely sealed within the main frame section. I haven’t actually seen or weighed one of these in person, but got feedback on the details from Richard and saw a photo on the Gocycle accessories website here. Take good care of this battery, because a replacement will set you back $900! That’s a lot of dough for a relatively low capacity pack, offering 21.6 volts, 13.5 amp hours, for a total of 291 watt hours of capacity. 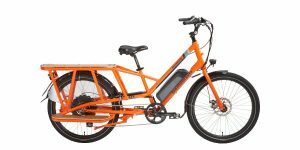 I’d say that 36 volt 10 amp hours is about average, many full sized ebikes are now offering 48 volt 10 amp hour packs (so that’s ~360 wh or ~500 wh respectively). Perhaps it’s the custom size of this battery that makes it expensive or the lower volume of production? 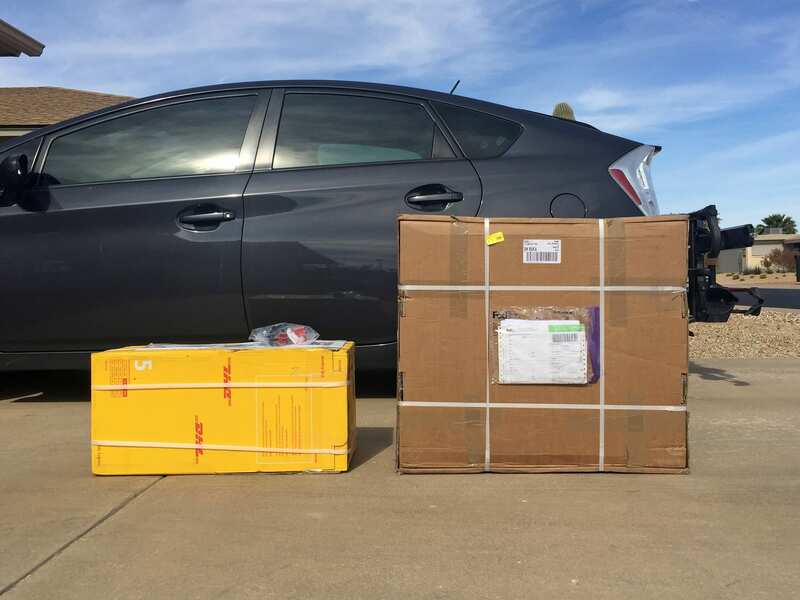 I’m sure they went with a lower capacity to reduce the weight of the bike and felt that 18 to 50 miles was good for a compact platform… which I agree with. The wide range estimate comes back to use case, are you a heavier rider who has lowered the tire pressure and is climbing hills with the throttle only? Expect to go further ;) but most of the time, riders will probably use one of the three assist levels which rely on pedal torque activation. In Eco or City mode, this bike should get fairly good range. I do really appreciate that the battery powers add-on lights and that you can purchase a four amp quick charger for ~3.5 hour fills vs. 7 hours. I’ve been taught that it’s best to keep Lithium-ion packs charged above 20% to avoid stressing the cell chemistry. 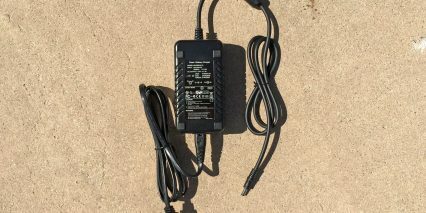 The default two amp charger may be slower, but sometimes slow charging can be easier on the cells… and this charger is definitely compact and lightweight at ~1.5 lbs. If you find yourself getting near 20%, one or two hours of charging will easily get you back up over 60% and you can hop back on for a ride. 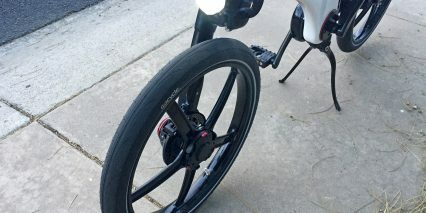 The only real downsides that I found, with regards to the battery implementation, is that you have to plug the bike in vs. being able to leave the bike outside and only bring the battery to a charging outlet. If the bike is wet or dirty, this means that you could be bringing a mess inside… and even though it’s lighter than most, you still have to lift ~37 lbs vs. a 6 lb battery. Also, you cannot tap into the battery capacity with a USB port to maintain your phone, it just doesn’t offer that. And your phone may be drained quickly when using the Bluetooth app to adjust power settings and display your ride speed, battery level, trip stats, and other bicycle details. If you’re concerned about this, an affordable workaround is to get a phone case with integrated battery like one of these. 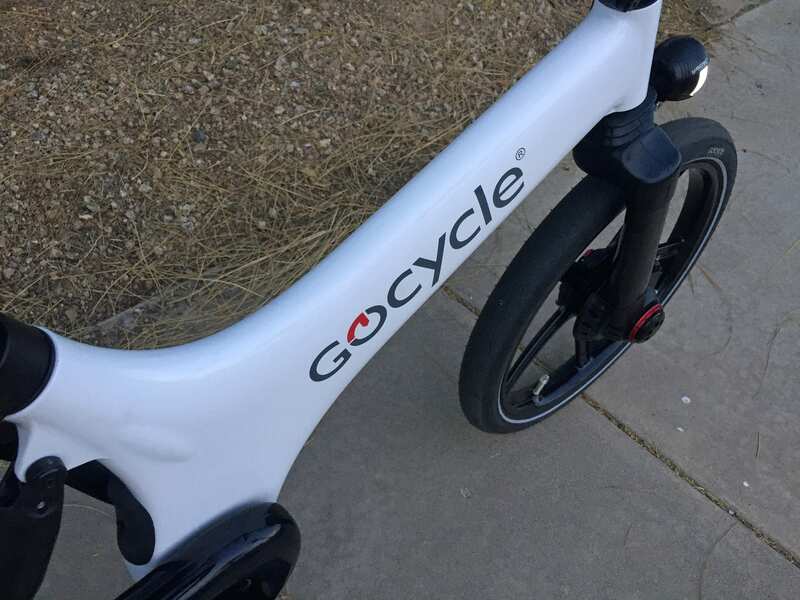 Activating and using the Gocycle can be quick and easy (just turn the bike on by pressing the rubberized button near the charging port for a couple of seconds), or a bit slow and interesting (the app is impressive, but pretty deep). 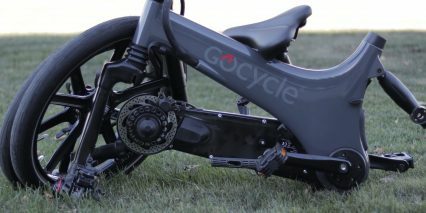 Gocycle has great YouTube and Vimeo channels with bite-sized video tutorials for almost every accessory, folding process, and app setting. This is why I didn’t go super deep in parts of my video review, they’ve got it covered. It’s nice, but can also be time consuming. The app setup involves a few main steps: downloading the app, activating Bluetooth on your phone, turning the bike on and standing nearby so your phone recognizes it, connecting with the bike, then launching the app and selecting the bike, then walking through a 15-step setup process… and there’s a two-minute video for most of those steps. 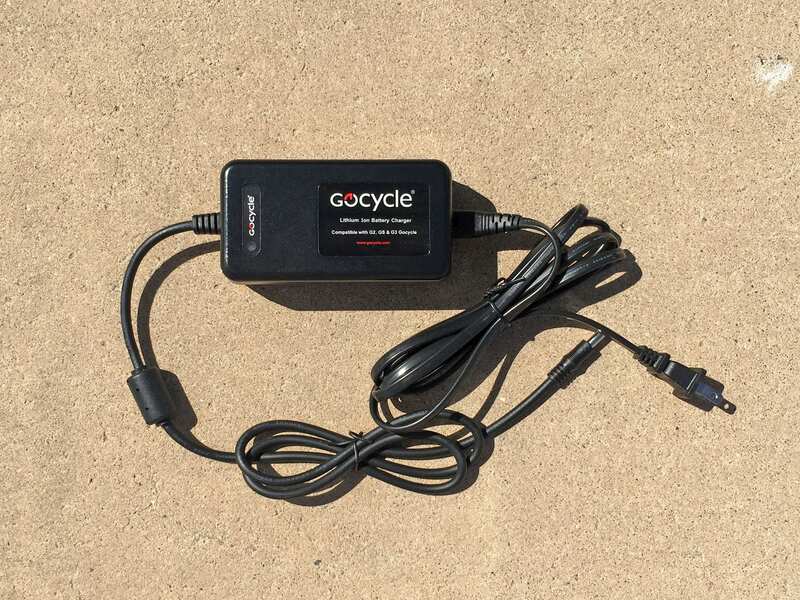 Once the app has been setup, you’ve got an additional level of security and control, because Gocycle can remotely de-activate your bike if it’s stolen. That might not aid in direct recovery, but does serve as a deter to theft… and you could always purchase independent bicycle insurance to cover both the bike and expensive accessories that might have been added. So, back to the app, there are options to activate the button throttle to work without pedaling (only for the USA) and sections for changing the power characteristics of each assist level, you can make a manual assist profile to compliment Eco, Sport, and Sport Plus, you can change what shows up on the dashboard… it’s pretty great. 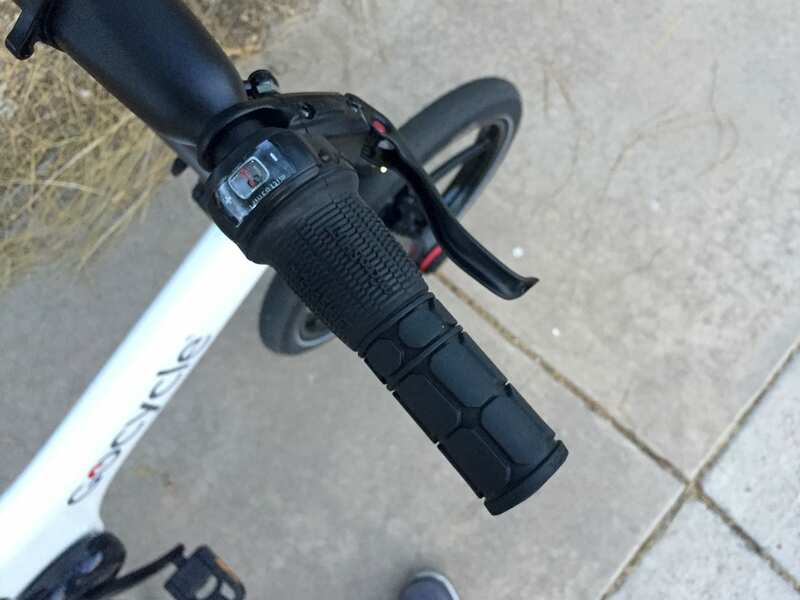 The only downsides I found were the tedious onboarding process, phone power use while riding with the app on, and the potential for your phone to overheat in the hot sun, not show up very well because of glare, and bounce around a bit in the rubber band holster. The bands were very tight on my iPhone 6 Plus, but it’s a one-size-fits-all approach, so that’s understandable. Again, I was able to reach the display and change assist settings on the go, but am not sure this would really be necessary while riding. And, I love you don’t have to have a phone connected in order to ride the bike with the default assist, or have the display of your phone switched on to use the app and stay synced. I never saw the app crash and it always recognized the bike pretty quickly when re-connecting for each ride. At the end of the day, this is definitely one of the nicest folding electric bikes on the market today. Richard and his team have done an incredible job creating a comfortable, reliable, and high-performance product. They seem to have approached the market like Tesla has with automobiles. Beginning with ultra-expensive premium builds and then whittling down to a more affordable mass-market build. That’s what the GS is, still way above average, but not quite as fancy or expensive as the G3. 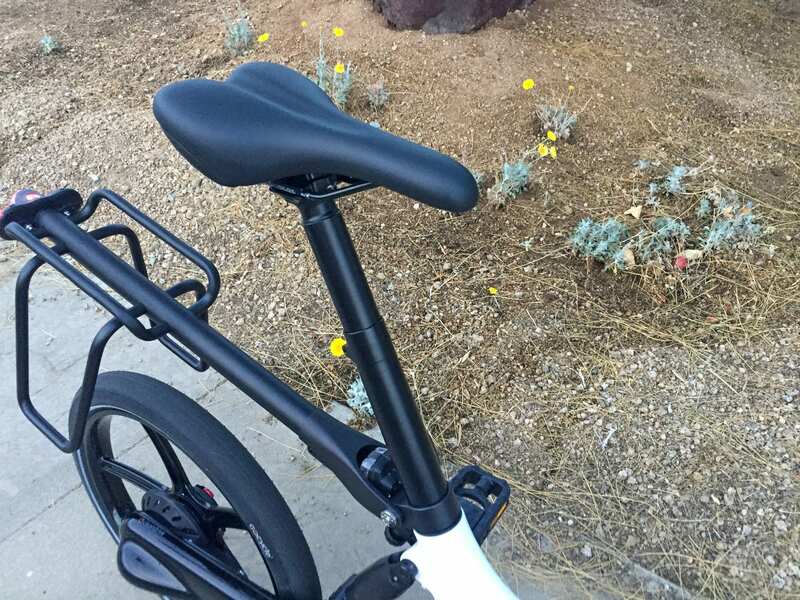 I didn’t get a chance to test out every accessory, but the rear rack was pretty neat… it attached securely in two places, was positioned well to stay clear of the saddle and tires, and it was sprung to keep your gear from getting banged around. 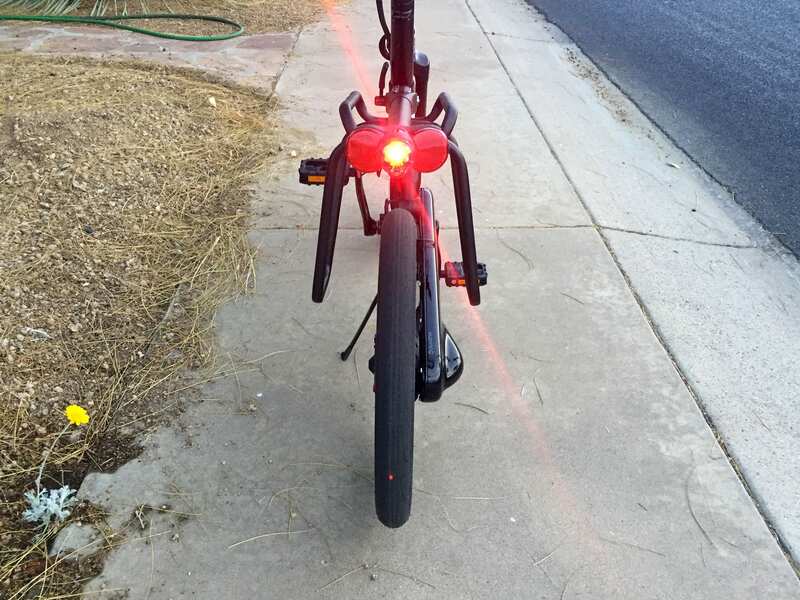 I would definitely opt-in for the light kit to be safe, but the white frame and reflective tires made a big difference on their own. My father is over six feet tall and I’m 5’9″ but we both felt comfortable on this bike, and I think it would work very well for petite riders as well. It made me smile to see the aqua and pink Cleandrive casing options. It’s amazing how much this one electric bike can do, given that it only comes in one frame size. Richard said that they really haven’t had to change the main frame at all since the G2. It’s easy to feel sensitive about price if you’re on a budget, but I’m thankful that a product like this exists at all because it just works so well. If you could only get one folding or portable ebike, this would be one of the top contenders. It strikes a balance of performance and cost, probably leaning more towards performance than what you have to pay. Yes, the accessories are expensive, but they are all custom too, and they work very well. 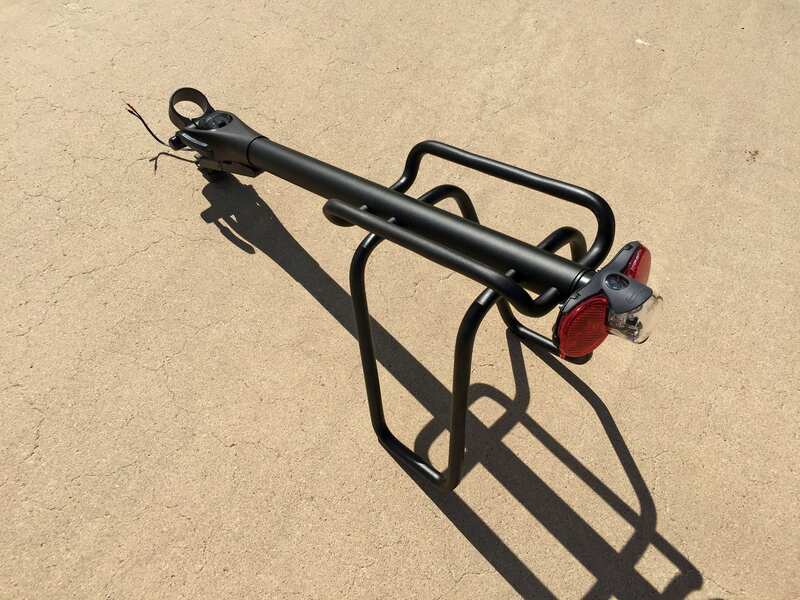 The bike is quiet, durable, and folds fairly easily. I want to thank Richard one more time for partnering with me on this review. EBR actually covered it once in late 2017 but we weren’t able to see the rack or smartphone app and it was a privilege to take a second look. 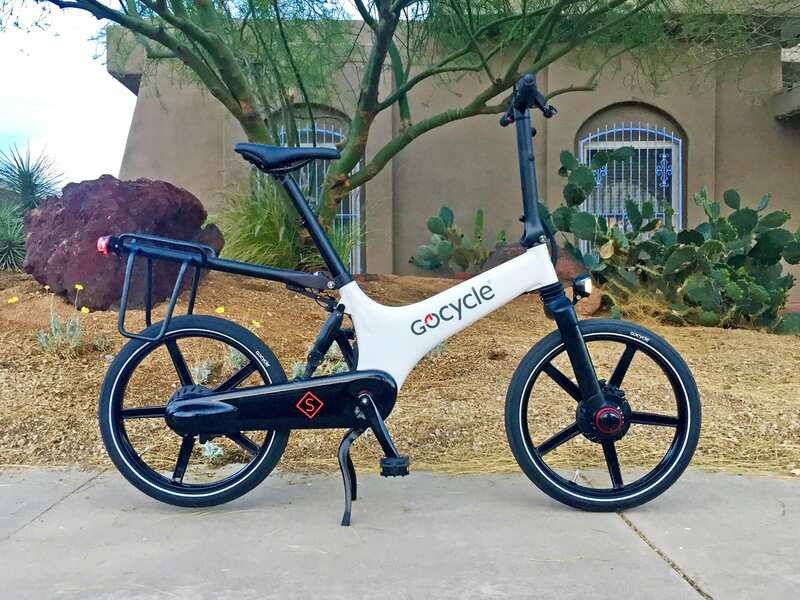 As always, I welcome your feedback and questions in the comments below or the Gocycle Forum to connect with real-life owners. 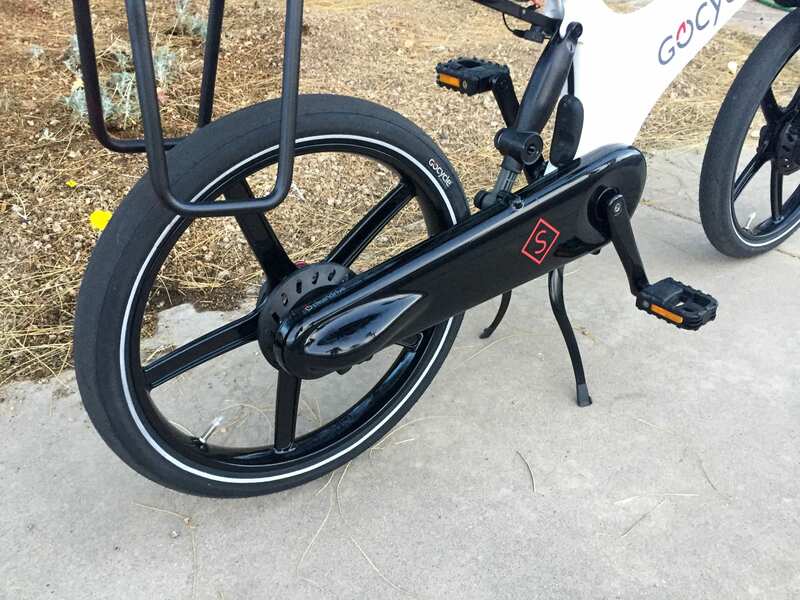 As a quick point of clarification, the Gocycle will stay in whatever mode it has be set up in last if you do not pair with the smartphone app. 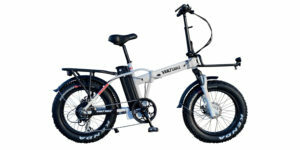 Considering the lower frame position of this bike, because of the smaller 20″ wheels, and the potential for riders to be in new unfamiliar locations,since it’s a compact folding ebike, I love that they are offering a highly visible white frame option, and that the tires have reflective stripes, it’s also great that they sell a bunch of integrated light options including one on the rack! It’s not ECO. Bicycles have been Eco for hundreds of years because they require no fuel except the rider’s legs. This you have to plug in and drain the grid. In fact you drain the grid twice because you have to constantly charge and use your phone also. 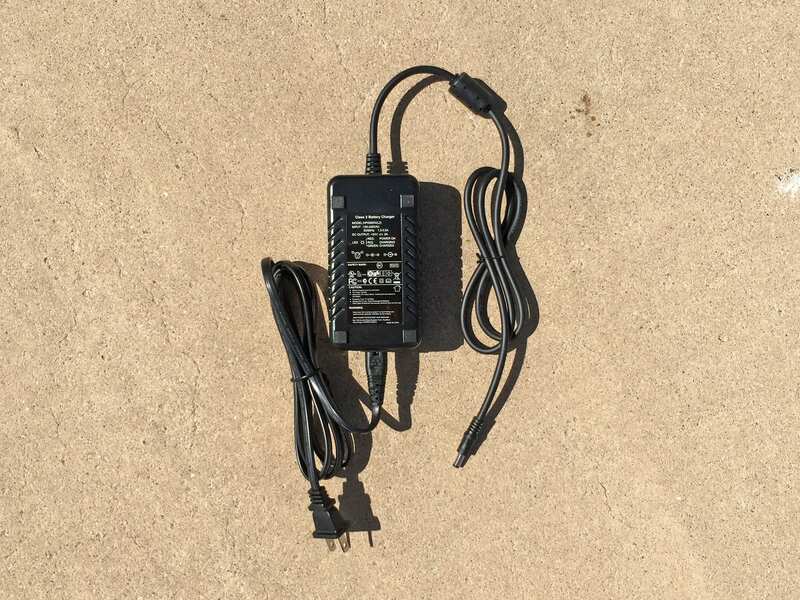 And, if you are using this for your bike as well as all the other everyday things you use it for on a regular basis, you’ll need to charge even more. It’s a huge step backwards. Think draining the grid is a bit ridiculous? Think how many phones in your neighborhood, every family, sometimes 3 or 4 phones in a family and multiply that by the population of your town. That is a lot of power drain. And a product that is dependent on another product which both need to be charged is not a good thing. Love the way you quickly dismissed the importance of a bottle cage. Anyone going far on a bike needs a place on the frame to put water bottles. You simply cannot see phone displays in bright sun and to see it at all you are using brightness at the max and draining the battery again. That disassembly process and reassembly will get old fast. A regular folding bike takes less than a minute. Is this bike interesting? Sure. Is it fun to ride? I’ll bet it is. Practical? No. Eco? No. Affordable? No. Easy to maintain? Drop it into any bike store and, Hmmmm! 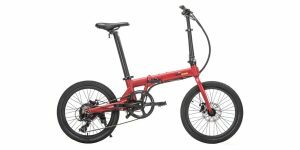 I’m just getting ready to tour on a much lighter folding bike that folds much faster, much smaller than this, costs less, needs no charging, is lighter and has water bottle mounts, doesn’t depend on a phone and is user serviceable on the road. Why the heck would I need this? To look flashy? To be too lazy to pedal up a hill? Because it’s new? Because I need yet another electricity guzzling device to plug in and charge? 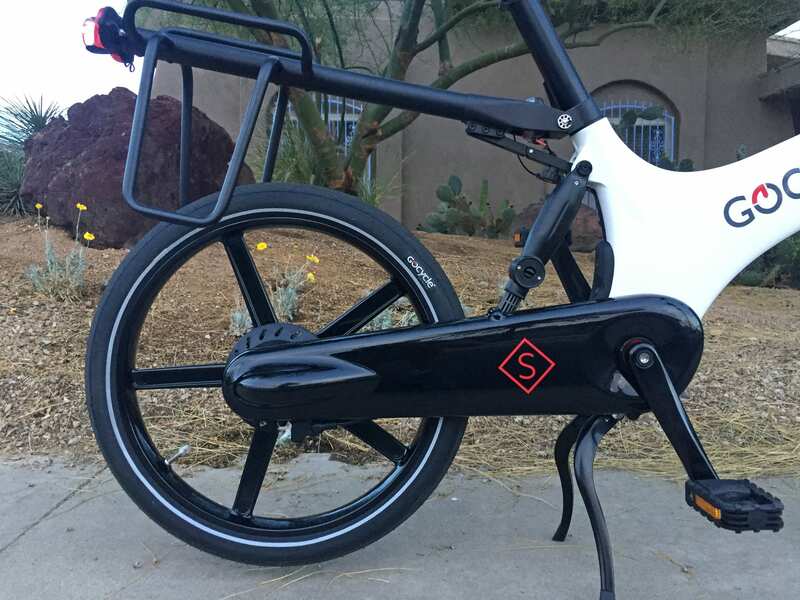 This is a bicycle that wants to be a Tesla when it grows up, but isn’t. 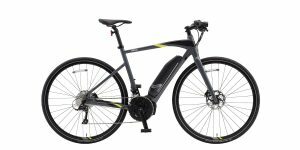 Electric bikes can actually be more environmentally friendly than human powered bicycles depending on diet, terrain, and distance in question. Think about the calories that have to be consumed by a person and then converted into chemical energy… back to kinetik, some lost in heat etc. in order to power a bicycle. Electric motors (that are charged off of an ever-greening grid) are actually more eco friendly in many cases. Minimal energy is used to charge smartphones, and knowing where you are going or being able to take calls etc. on the go may empower riders to commute by bicycle vs. car. Here’s a deep-dive with more numbers to back up this efficiency concept, and I’m not trying to best you with this answer, just share a different perspective. I mention bottle cage bosses (or lack thereof) on almost every review I do. Depending on the type of bicycle, they may be more or less important. A touring bike should have lots of bosses for racks, accessories, bottle cages etc. but a folding city bike might not need them as much. Many mountain bikes will be ridden by cyclists who have a backpack on, with a hydration pack inside. I’d love to see bosses on all bikes, but can see why they are not always included, especially to reduce weight and increase frame strength/integrity. I agree that not only is the phone difficult to see in this video (and in many cases in real life when it’s bright out), but also that direct sunlight can be damaging to LCD and OLED displays. There’s room for improvement here, and I like that the bike can be operated without the use of a smartphone if you want. It’s not required. 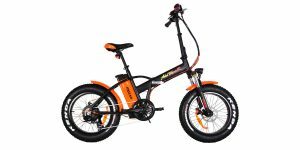 There are indeed many other folding ebikes (and regular bikes) that assemble and fold more quickly. Most of them don’t get as compact as this and almost all of them are heavier. It’s just a trade-off, that’s why I do these reviews… to help people consider the alternatives and get a deeper look at each product. Hey, thanks for your amazingly fast response to my comment. 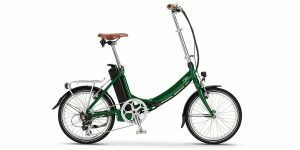 I did enjoy your very detailed (and helpful for e-bike fans) review and I can agree with some of your justifications for an electric bike. 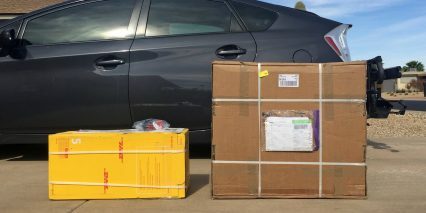 Certainly, your knee injury is a very valid reason to have one and I sure can’t argue with the advantage when going uphill or hauling a load. I do not believe for one moment that smart phones consume little energy. Not when you consider they are being charged constantly, in most cases by every owner, every night at least 365 times a year! That’s a lot of energy that was not being used before people found it necessary to text and surf the internet all the time when we managed perfectly well without that for centuries. I have a phone and an iPad but I hate that I have to feed them power all the time. One of the things I love so much about bicycles is the very fact they are free of being plugged in. Of course, that’s just my opinion. This bike’s footprint in the picture looks much larger than my Brompton or Bike Friday Tiket (both companies having recently introduced their own electronic bikes) so I wouldn’t call it compact. Still, it’s nice to have choices and conveniences. If I bought this bike, it would take longer to pack up small and put back together for train or bus and I’d have to worry about charging a phone AND the bike. And, since I’m not yet a robot, I still need a goodly amount of food and calories regardless of whether I’m cycling or not. Like I said, interesting concept though. Some people will love it.